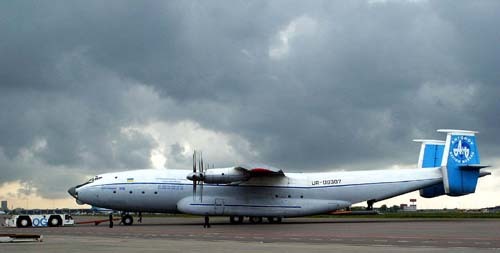 UR-09307 of Antonov Design Bureau arrived at Amsterdam IAP on April 15th 2003 on the first of 2 subservice for DAS Air. Destination of the cargo was to be Kuwait. It left the next day, around 2130lt. The 2nd arrival was on the 20th, when this photo taken and again it left the next day. The thundering noise of the contra-rotating props was deafening ! 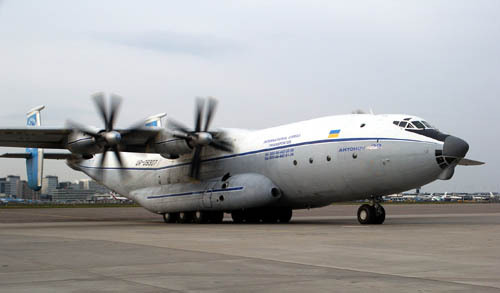 But an experience you don't want to miss..
AN-22A UR-09307 is commercially operated by ADB / Antonov Airlines and has construction number 043481244. 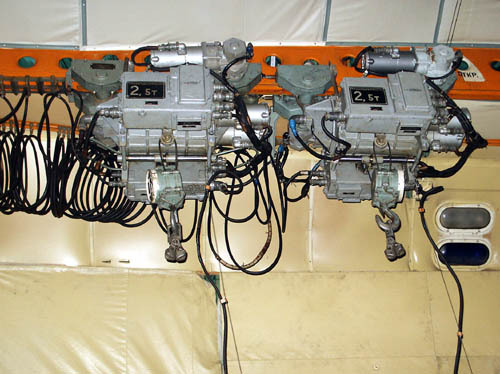 The contra-rotating props show a large array of blades. 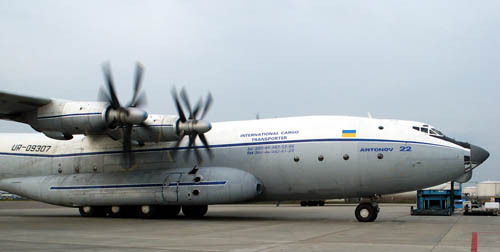 The shape of this huge Antonov transport is unique and one of its kind. This photo was taken on the 16th, it departed later in darkness. The door opens and groundcrew get to work. 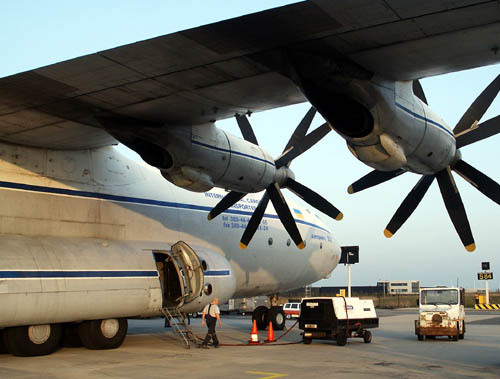 The An-22 always seem to travel with a large crew, but also seem to be equipped with manpower and equipment to do every job wherever ! 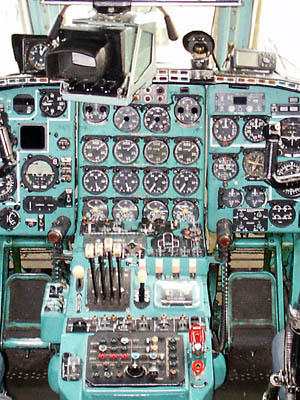 Next to the door is also the APU, which produced a LOT of noise in itself ! 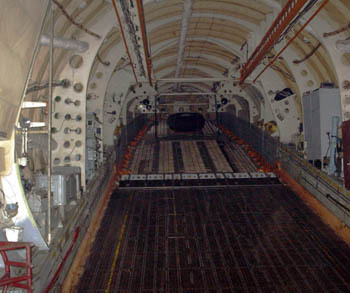 The bulkhead has several doors, crew appeared from everywhere. 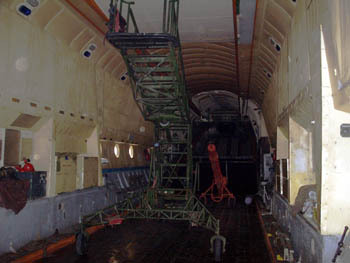 The door on the right leads to a small staircase to an upperdeck where one has access to the cockpit. 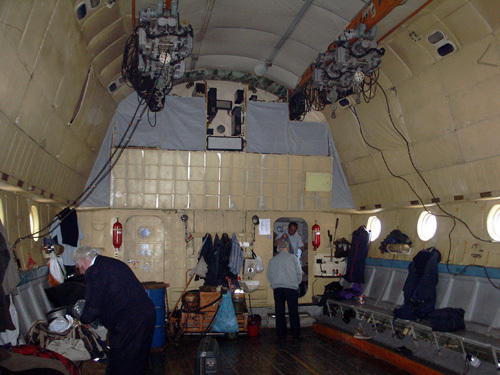 The cargofloor of the An-22 has no rollerdeck and smaller cargo is placed inside the aircraft with forklifts and larger sized cargo is hoisted onboard thru these contraptions. While UR-09307 arrived emtpy on both occasions (15Apr and 20Apr), it brought a large towbar and stairs on which the engineers could work on the engines should there be such need. 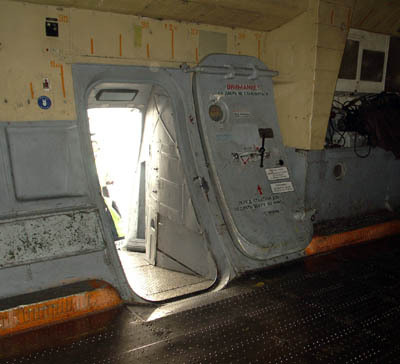 The door to the ramp from inside the cabin; there is a large rotating device which closes the door tight, it reminded me of a submarine ! 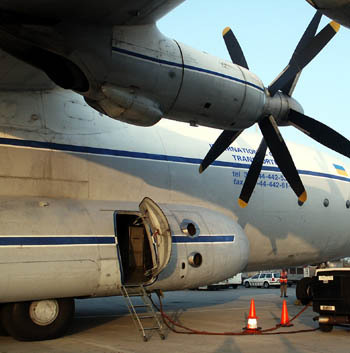 The aftramp can fold down so cargo can be driven in or hoisted on board. Being so low to the ramp is a great advantage esspecially on airports with primitive resources. When the aircraft departed, it performed a pushback with the engines not yet started and the ramp down, so the towbar could be brought onboard. There is a spare wheel at the end of the ramp, no doubt it will be relocated when loading begins. 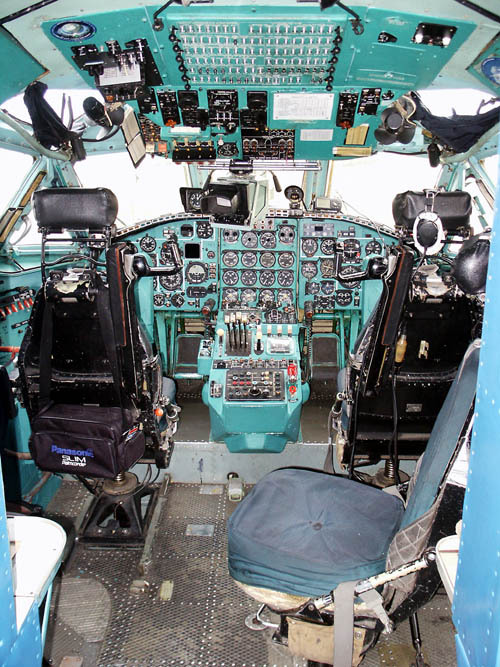 The cockpit is quite high from the ground, but not crowded at all. There is a monitor for use by the commander and I was puzzled by it, what's the use ? Fortunately, Alex Waning came to the rescue and found out it is a weatherradar, named "Groza"(meaning something like "Thunderstorm"). On a further search on the internet I found this: "The radar is designed for detection of hazardous for flight areas of active thunderstorm, determination of airplane drift angle, as well as ground mapping for landmark orientation." Crowds had gathered around the fences at Schiphol, many not wanting to miss this unique event: a rare visitor such as the An-22 on a beautiful day, with a departure during the daytime ! And it was a sight to behold. 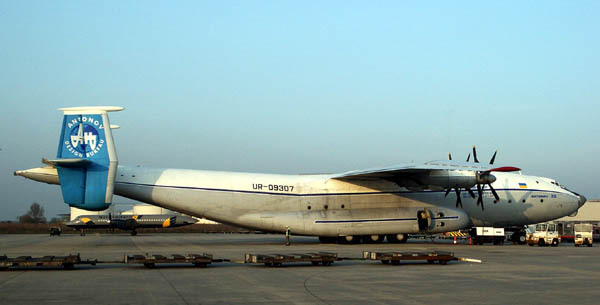 UR-09307 is the last commercially used An-22 and rumor has it that it is to be retired this year... Let's hope not ! Many raced towards runway 09 for its departure; the sound I find hard to describe: a throaty rumble and roar, the contrarotating props make for a unique sound. The slow rate of climb adds to the lumbering, massive image of the An-22 (again, Dinosaurs spring to mind !) 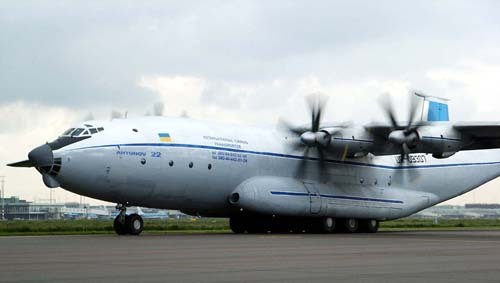 and while the take off is at a leasurely speed, it is only too soon that the An-22 disappears out of view and that unique rumble fades away. 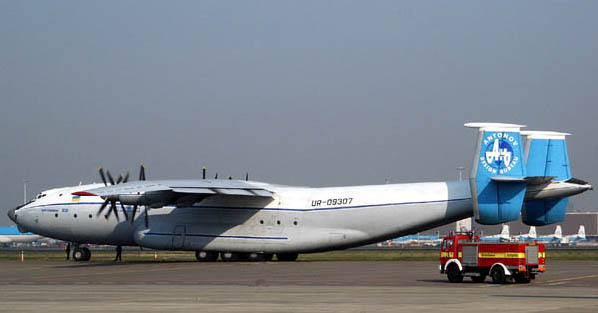 May 25th, 2003, a revisit of UR-09307 to Amsterdam IAP..
UR-09307 returned to Schiphol to pickup a helicopter, which had been flown in on KLM Cargo. It was expected on wednesday, was delayed to saturday, only to be delayed again to sunday... It arrived at noon and was scheduled to depart at 18:00, but loading was completed much mor equickly and departure was advanced to 3 pm. Only to await the towcart (and rain !) for the (silent) pushout, at 4 pm. When the towbar was loaded thru the rearramp, the NOISE began...!! Hours after the An-22A had left, the ringing in my ears continued... Click here for a larger image and return by using your "back"-button.